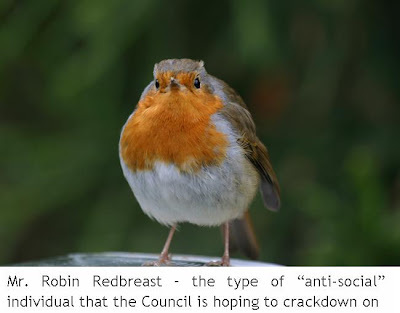 The Cowan Report: Council Crack-Down on Chirping Birds? H&F Council’s latest zero tolerance target for anti-social behaviour is, er… birdsong. According to the local Chronicle; Dorothy Berry of Dawes Road, Fulham, received a letter from the local authority saying “I regret to inform you that [we] have received a complaint alleging nuisance caused by birds singing… in the early hours of the morning”. Mrs Berry says she does not have any pet birds but admitted that the wild birds in her garden do sing early in the morning. I’m sure there’s a rational explanation for the Council’s over zealous behaviour. Then again… maybe not. Youths congregating in playgrounds around the estate. I guess they're supposed to migrate with the antisocial birds. Is H&F council prepared to suggest alternatives in order to stop the antisocial behaviour. Also what is being done about the council's own antisocial behaviour? Their staff can be rude & bullying, is there going to be a change in that? Is this kind of thing what tax payers are really funding? Wouldn't it be more worthwhile for the council to put all this effort into the improvement of sub-standard housing? & providing places to keep the youths & birds occupied so they aren't forced to congregate in parks? If parks are not built for our youths, who or what are they built for? decoration? Please somebody plug the brain pool into the mains & give those poor council workers all a boost. Ordinary birdsong is a natural thing and it is ridiculous to critise it. I do however object to my neighbour keeping birds in cages that squeal all day. They belong in the jungle.